Radiography make up 90% of all research conducted at X-ray diagnostic systems. That is why X-ray diagnostic systems for RAD are the most popular in medical facilities. X-ray systems - X-ray diagnostic systems RDK-VSM for RAD, produced by «KUFP «Medaparatura» are intended for the X-ray researches on the bucky table with "floating" deck and on the bucky stand and for digital radiography on the bucky stand using DR-system. Due to the original software it is possible to perform X-ray image processing, archiving and data transfer according to the protocol DICOM, as well as the production of supporting documentation and statistical processing. X-ray systems - X-ray diagnostic systems RDK-VSM, produced by «KUFP «Medaparatura», equipped with tomographic device, allow providing analog linear tomography. Our X-ray systems are equipped with X-ray tubes only from imported manufacturers, such as IAE (Italy), which ensures the reliability of the system throughout the entire lifetime. Systems are equipped with imported X-ray generators. 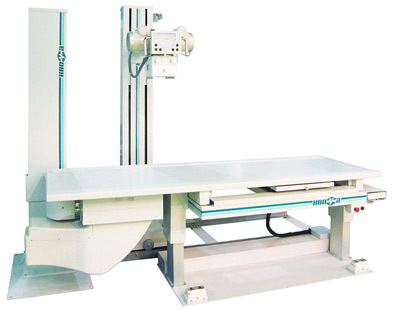 X-ray systems may be equipped with bucky table with lift (models - CT-1 (Ukraine), UPPER (Italy)). Vertical movements of the table facilitate the researches of children, the elderly, and patients with limited mobility or injury. And the use of «floating» table provides accurate positioning of the patient. Models UPPER (Italy) are supplied without linear tomography. Ukrainian table CT-1 includes tomography function.